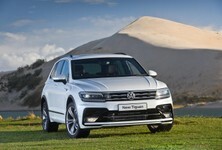 The new Volkswagen Touareg has touched down in South Africa. It's crammed with technology and luxury comfort features, plus offers genuine off-road capability. 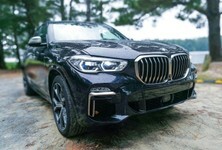 However, in the status-obsessed premium SUV segment, the badge on a car's nose carries so much weight. Will the newcomer attract customers in the way its predecessors couldn't? Much is expected of this, the 3rd generation Volkswagen Touareg. It's predecessors, most notably the 2nd iteration, offered a commendable blend of comfort, sophistication, practicality, off-road prowess and even value for money. However, in this segment of the market, brand image counts for a lot and the Touareg has been overshadowed by more glamorous competitors. Despite this, it still managed to tally up a reasonable number of sales; in fact, almost a million units found homes globally. 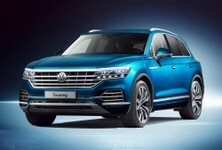 Third time lucky is the saying which comes to mind with the latest generation Touareg. After spending 2 days driving the newcomer across multiple terrains, we hope to answer the question: Can Volkswagen's premium SUV beat the best? 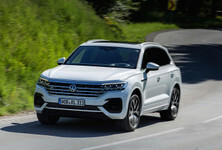 Underpinned by the Volkswagen Group's MLB platform which also forms the basis of the Audi Q7, Bentley Bentayga, Lamborghini Urus and Porsche Cayenne, the new Touareg is wider and longer than its predecessor, but slightly shorter in height. Interestingly, the overall mass of the vehicle has declined thanks to the clever use of lightweight materials. Volkswagen claims it's up to 106 kg lighter, which is a substantial weight saving. Under the big bonnet of the Volkswagen Touareg, you'll find a big 3.0-litre V6 turbodiesel. We've seen this engine before in other applications such as Amarok V6 and it is a commendable engine due to its refinement and power delivery. Power is rated at 190 kW, with 600 Nm of torque going to the Volkswagen 4Motion all-wheel-drive system via an 8-speed automatic gearbox. In terms of looks, we quite like what we see. It's sharp and angular, particularly with the R-Line kit that comes standard with the higher-specced Executive. If you opt for one of the darker hues of colour, you're able to appreciate the intricate front end design more. In white, a fair amount of detail is lost. One of the highlights is the IQ Light Matrix LED headlights, which features 128 LEDs. The cabin has seen a raft of changes and while it is an option, the Volkswagen Innovision infotainment system is highly commendable. Not only does it incorporate everything you'd ever need in a car, it's also magnificent to look at, thanks mostly to the size and resolution of the screen. Essentially, Innovision merges the digital dashboard with the Discover Pro premium infotainment system, to form one unit. There's plenty of customisation options and themes to make it your own. Connectivity is key and when you're going for a flagship offering, you expect only the best, and the Volkswagen Touareg delivers. There's a wireless charging pad and two USB ports in the front, as well as Bluetooth. The safety tech is worth a shout too. Volkswagen has introduced a night vision camera, the car features lane assist, there's a heads-up display (which is one of the better units we have experienced) and there's even active 4-wheel steering. For ultimate comfort, the seats are heated and cooled too. The MLB platform lends itself to excellent practicality, and cabin space in the new Volkswagen Touareg is good. Rear legroom is more than enough to accommodate adults in comfort and the luggage space (a claimed 810 litres) generous. Volkswagen claims the load bay is 113 litres bigger than that of the previous-generation Touareg; it certainly seems larger than the BMW X5, for example, but is slightly smaller than the Audi Q7 (890 litres). The Volkswagen Touareg is at home on the open road where it impressed us with its quietness and refinement. V6 engine is stonking. 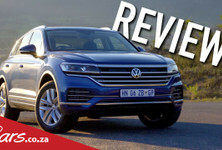 Several big Volkswagens have endeared themselves to us with their excellent refinement (low NVH) and premium feel, and the new Touareg is no exception. The high driving position is commanding and outwards visibility is good. You sit high up and you have that big car feel in abundance. One of the many things we were really impressed by was the refinement of the V6 turbodiesel engine. It's capable of delivering impressive shove, yet there's hardly any noise from the motor. Only when you're really stretching its legs, do you hear some sort of V6 grumble, but the cabin is so well isolated, you could probably drown it out with some music from the high-quality sound system. The 8-speed transmission is refined and smooth too, and while the car does offer steering-wheel gearshift paddles, we left them alone and let the car do all the work. It features various driving modes such as Comfort, Sport and Offroad (including Snow, Gravel and Sand). In Comfort, the suspension is almost too soft: there was a slight wallowing feel when cornering, which we'll put down to the air suspension. The air suspension is a decent setup and you can raise/lower the car to suit your needs. Activate one of the Offroad modes and the vehicle rises up to clear obstacles, which is handy. The steering is not the most direct and there's not much feedback through the 'wheel, but that's acceptable in this segment. Indeed, driving the Touareg over long distances is a very relaxing affair – after travelling around 250 km in one stint, we ended the journey feeling quite comfortable and refreshed. 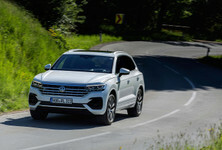 We had the chance to pilot the Touareg through some forestry plantation roads and while the course wasn't going to provide a stern test of the Volkswagen's off-road capabilities, it was a scenario where we'd tread carefully with a normal passenger car. With the Offroad gravel mode engaged, the Touareg didn't bat an eyelid and there was no loss of traction. Through some of the rockier sections, it felt surefooted and we're confident that it'll take some serious terrain to throw a Touareg off. Look, it's no Land Rover Discovery when it comes to the traversing technical 4x4 courses, but that's okay as the Disco costs substantially more and doing serious 4x4ing is not something these premium vehicles do often. When you pitch a premium SUV with a Volkswagen badge into a market dominated by high-end brands such as Audi, BMW, Mercedes-Benz and Volvo, the odds are not stacked in your favour. People are unfortunately brand snobs and are likely to look down on Wolfsburg's offering, which is a real shame because this new Touareg is very good. Not only is it refined and comfortable, but its also superbly finished and there are enough tech toys to satisfy everyone. The engine is a peach too and there's plenty power for towing. Thanks to all that torque, overtaking is effortless. Volkswagen knows the Touareg has its work cut out, so the newcomer has an ace up its sleeve. Unlike most high-end German products, you don't get a basic specification, which you then have to load with options (you could almost double their list prices!). Nope, not with the Touareg... It's already comprehensively kitted out and even in basic spec without the digital dashboard, there's enough luxury and tech to satisfy the vast majority of customers. In terms of price, it substantially undercuts those high-end rivals, which may be enough to sway some customers in favour of the Volkswagen. With the market expanding in 2018 with an all-new BMW X5, Mercedes-Benz GLE and Audi Q8, we expect the prices of those vehicles to start around the R1.3 million figure, before extras, making a fully-loaded Volkswagen Touareg look like the premium SUV bargain of the year. The new Touareg comes standard with a 5-year/100 000km maintenance plan, 3-year/120 000 km warranty, 12-year anti-corrosion warranty and space saver spare wheel. Service intervals are set at 15 000 km. Interested in buying a used Touareg?